This mod adds 8 new alchemy potions! 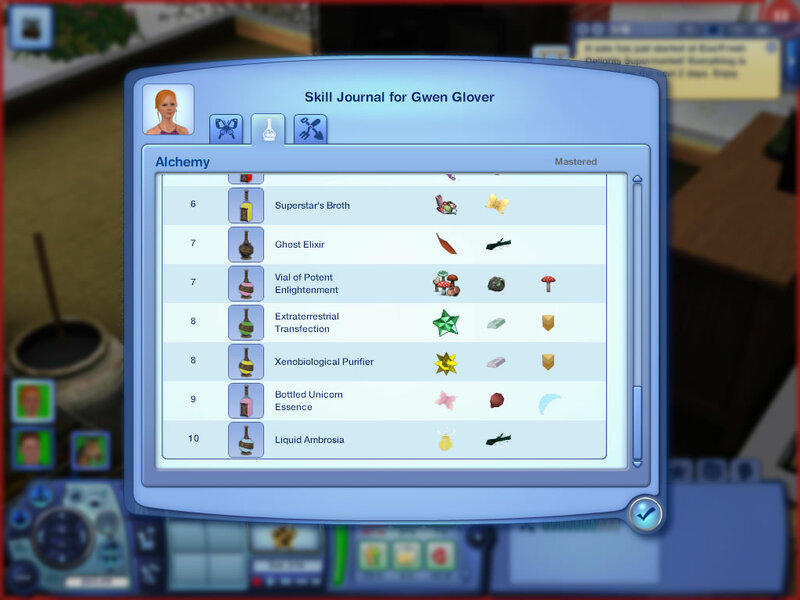 Sims can mix these potions, drink them, throw them, sell them, and buy them at the elixir store. Note: some potions require World Adventures, Late Night, Seasons and/or Pets. * All potions require Supernatural. If the testing cheats are enabled, you can Shift click potions to adjust their settings. You can set the death type Sims will get after drinking the Ghost Elixir. (Note: if the potion is poured on a pet, this setting will be ignored). 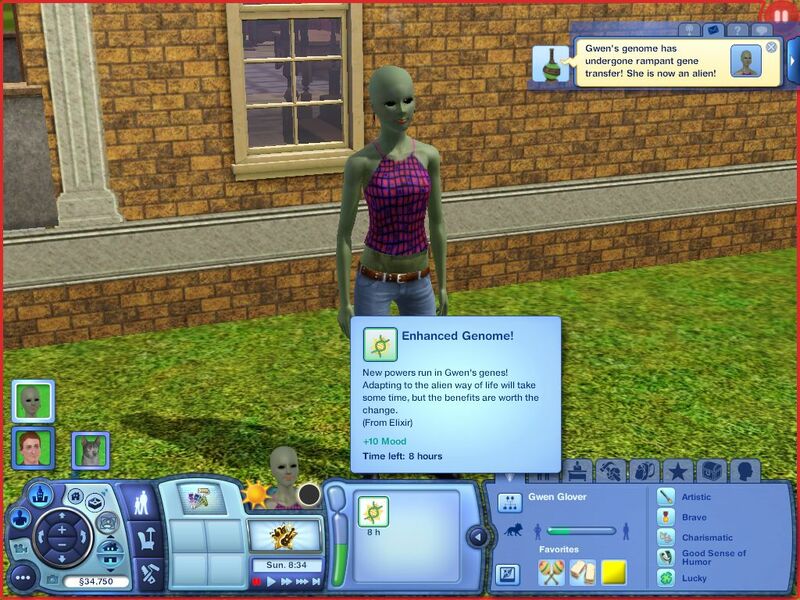 You can set the skin tone alien Sims will get when they drink the Xenobiological Purifier. You can set the alien DNA percentage Sims will get after drinking the Extraterrestrial Transfection. 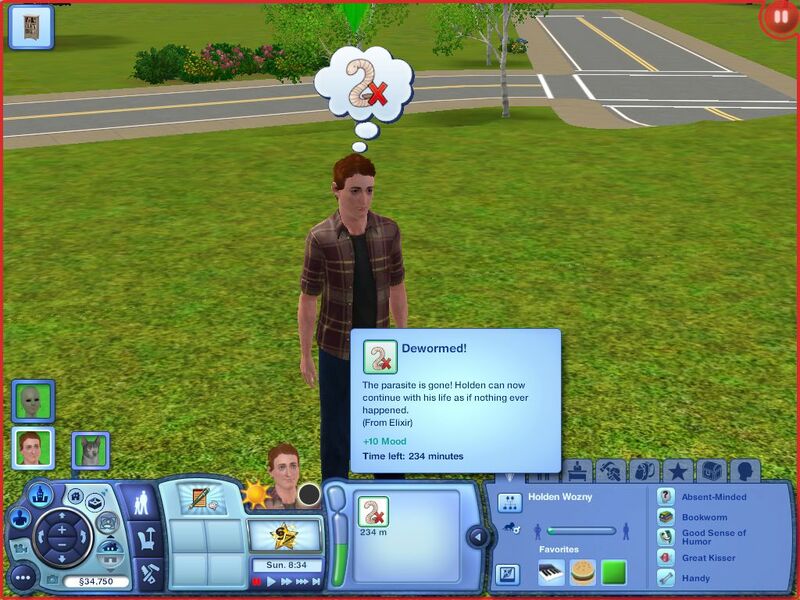 You can also set whether Sims that drank the Extraterrestrial Transfection keep their body hair, hair color, hairstyle or eyebrows. (Note: these settings apply to all Extraterrestrial Transfection potions). All these custom potions cannot be learned by researching alchemy in the alchemy station. 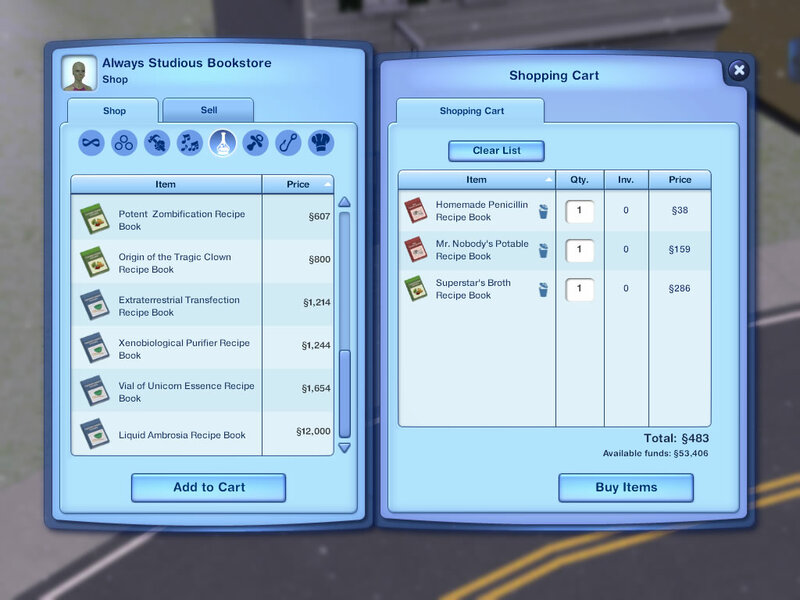 To learn how to prepare them, your Sim must buy a recipe book from the bookstore. Additionally, you can buy all the custom potions at the Elixir Store. * This feature is not included in the lite version. Note: the Jar of (Potent) Friendship and Jar of (Potent) Discord are the only potions that can be poured on wild horses and strays. 2012.12.22: Added Italian, German, and Russian translations. 2012.12.23: Added Brazilian Portuguese translation. 2012.12.25: Added Swedish translation, updated Italian translation. 2013.2.17: Added Chinese translations. Fixed a minor bug with the "Potent Cure Elixir" and "Phial of Unicorn Essence." 2013.2.19: Fixed Chinese translations. Updated for patch 1.50. 2013.3.4: Fixed minor bug with "Superstar Broth." Added new potion. 2013.3.12: Fixed bug with "Dryad's Spirit" (there's no need to redownload main mod). 2013.6.18: Fixed duplicate potion bug. Updated for patch 1.55. 2013.7.2: Added Chinese translations for "Dryad's Spirit." 2013.7.26: Added new potion and made "Age Freeze" pourable on pets. This is a scripting mod compiled against patch 1.55, but it still works with 1.57. It may not work with older patch versions. As it doesn't override game tunings, this mod won't conflict with other mods. As this mod adds new potions to the skill journal, uninstalling is not as easy as removing the package from the Mods folder. In order to uninstall this mod, first open the command prompt and type "UninstallCustomAlchemyRecipes" without the quotes. Then exit the game and remove the package. 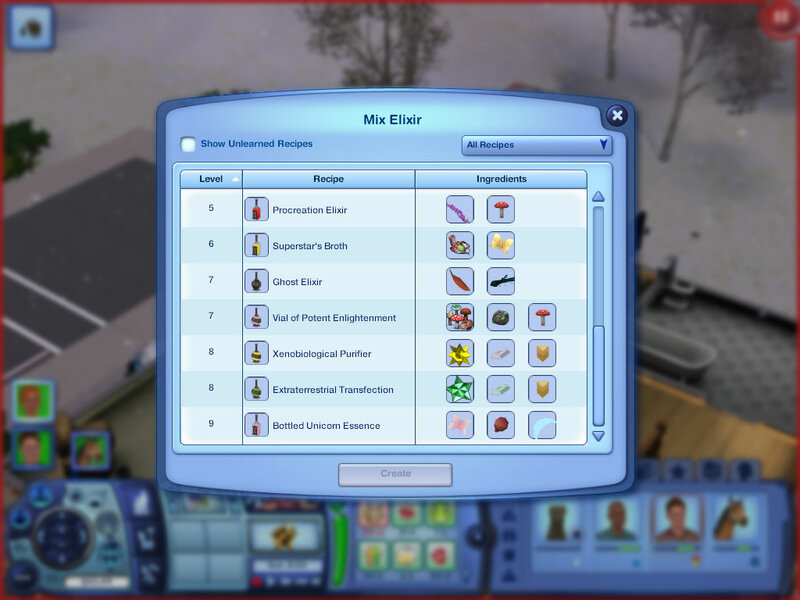 If you would like to help me localize this mod, download "SimsMxMoreAlchemyRecipes_stings.zip," unzip it, open the text file with Notepad (or other text editor), translate the text between the <STR> tags, and send me your translation. These instructions written by Twallan may help you. This mod wouldn't be possible without the tutorials, mods and/or help of Nona Mena, CmarNYC, and Consort. Thanks to the S3PE creators and developers. I would also like to thank Demagog, Dennis6791, kingisen83, michal22, quir98, Scatty, simslover666, tearscar, thiagopepper, wheatberry, and xwertyq1 for their translations.